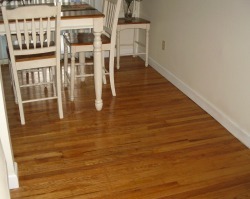 If you have a hardwood floor and it has seen better times, let me bring back its glory days. If you have a hardwood floor under your carpets and are thinking of re-carpeting, STOP! Consider uncovering that wood and giving your home a completely different look and feel, AND increase its market value. If you are in the market for a new home, look under those carpets. There may be a hardwood floor waiting for you to uncover its beauty. I refinish and rejuvenate your hardwood floors using a variety of methods from a full dustless sanding to a light buffing and resurfacing rejuvenation process. Call me for a free in-home consultation to learn how I can help transform your floors into something beautiful and vibrant.